Occupational Therapy: Live Life To Its Fullest! April is Occupational Therapy Month! With spring in full swing, it’s a great opportunity to learn how occupational therapy can help you or your loved one(s) live life to its fullest. Occupational therapy helps people of all ages do the things they want or need to do (occupations) by helping them prevent, or live better with, injury, illness or other limitations. It helps people regain skills after an injury, and it also helps older adults experiencing physical and cognitive changes, such as arthritis, stroke or breathing problems. It can even help children with disabilities be active participants in school and social situations. Occupational therapists are skilled health care professionals who take the relationships between the person, environment and occupation into consideration to develop an individualized approach to recovery. They take time to learn about a one’s psychological, physical, emotional and cognitive state to evaluate how his or her condition is affecting his or her ability to participate in activities of daily living. With this information, occupational therapists provide ways to overcome obstacles through a holistic approach. When natural aging, injury or illness affect a one’s ability to participate in daily life, occupational therapy helps a him or her stay active despite his or her limitations. For example, while recovering from a surgery, a person may need to learn new ways to get dressed, bathe or get out of bed. Pain from certain conditions may make it difficult to go to work, walk or keep up with daily chores. Occupational therapy teaches new ways to manage these obstacles, allowing one to stay as independent as possible, and it is an effective alternative to powerful medications that can cause memory loss or fatigue. After developing an individualized recovery plan, occupational therapy sessions typically last one hour per day every three to seven days, depending on the patient’s need. 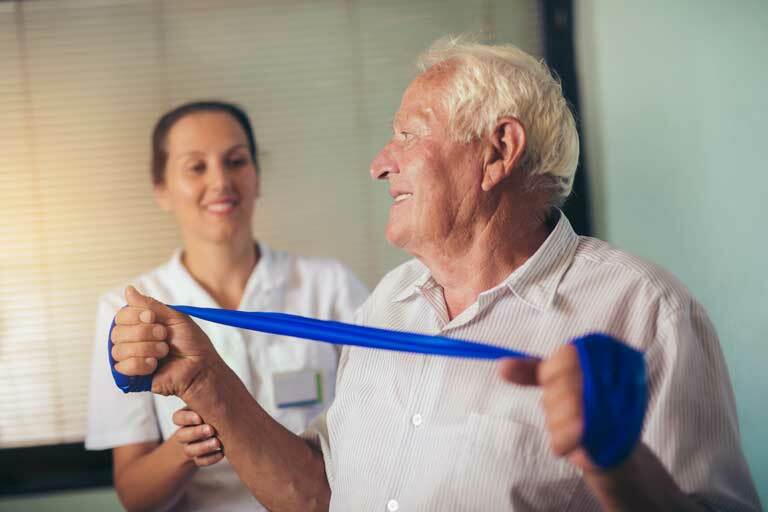 Sessions may include exercise and mobility training, which help address pain, joint stiffness and other areas that prevent the patient from completing everyday activities, such as eating, bathing and dressing. It can also retrain patients to perform higher-level activities, such as home management, cooking, cleaning and money management. Therapy can continue as long as the patient continues to make progress toward his or her goals, and progress is discussed in regularly scheduled care-plan meetings. A patient can graduate from occupational therapy once he or she has met his or her goal for recovery or has reached maximum level of independence. Often, patient and caregiver education may be offered before going home, as well as home assessments to reduce risk factors. Ultimately, the goal of occupational therapy is to restore the patient’s maximum level of independence so that he or she can live life to its fullest, regardless of his or her limitations.